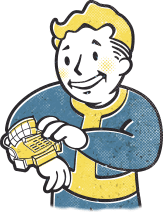 Wearing your copy of a Hubris Comic may not help you avoid damage, but it certainly will tell everyone of your love for Fallout! Hubric Comics Cover Art featuring The Silver Shroud, Mistress of Mystery, Inspector, Manta Man, and Grognak the Barbarian. ITEM WILL BE READY TO SHIP MAY 2019.